The biggest new feature is the furry editor. It allows you to design your own flurries and easily share them with your friends. I’ve also added an UI for assigning per-monitor flurries. You can now have a different flurry on each of your monitors. It has an updated configuration UI that exposes some existing options: an FPS indicator, the possibility to use a "Block Mode" or a "Whiteout Mode" and a way to shrink the flurry window to use only a percentage of the fullscreen window. 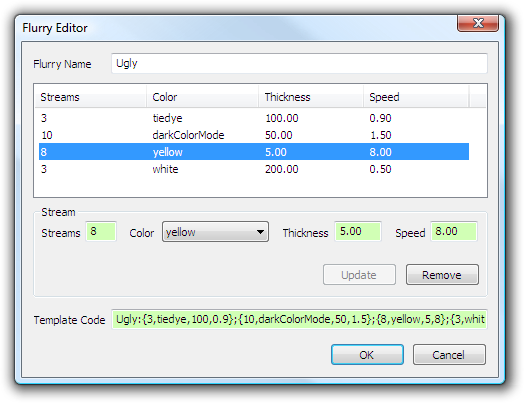 Under the hood, there has been quite a few changes with some heavy refactoring to prepare for the flurry editor. 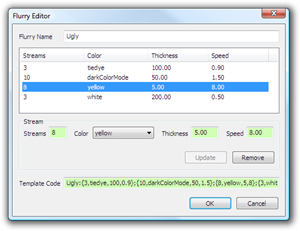 * Presets are saved directly after creation/modification. Deletion is effective when closing the main dialog.